Pat Kelly, was born and raised on the southeast side of Indianapolis. He is a graduate of Cathedral High School ’01 and obtained his BA from Franklin College in ’04 in Advertising and Public Relations. 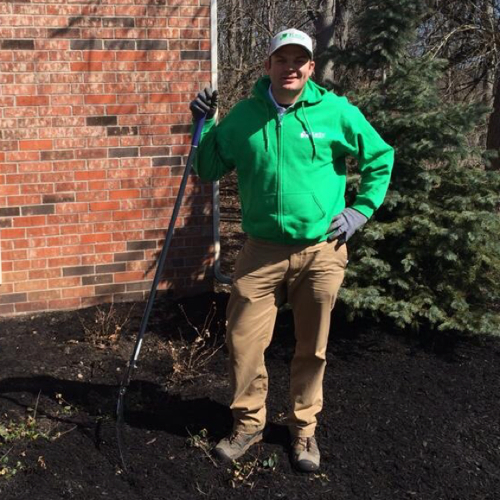 Before founding Kelly Landscaping, Pat worked for a small landscaping company on the south side of Indy and then as a manager with Brickman. In his 6 years at Brickman, Pat advanced consistently, eventually managing all of the install and construction operations for a team that produced $1.5 million worth of work annually. Kelly Landscaping was founded in March of 2014. Pat and his team strive to deliver top quality work at a consistent pace. KL currently serves residential, commercial and telecom customers with numerous services ranging from shrub removal and weed control, to design, install and mowing. Pat and his family live in Greenwood. He enjoys attending his kid’s games and practices, kayaking and fishing on local water and spending time with family and friends!